LAGO was contracted to prepare final technical memoranda and summarize the modeling methodology and scenarios, and present the results and finding of the simulations. 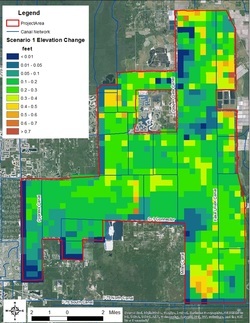 LAGO addresses the scenario analysis and comparison of results to estimate the change in Base Flood Elevation (BFE) that may result from the alternative build-out scenarios in the Golden Gate Estates (GGE). The 100-year/24-hour storm event was applied to the MIKE SHE/MIKE 11 existing conditions model. The initial conditions for the storm event were extracted from the five (5) years of simulation results generated by the existing conditions model. 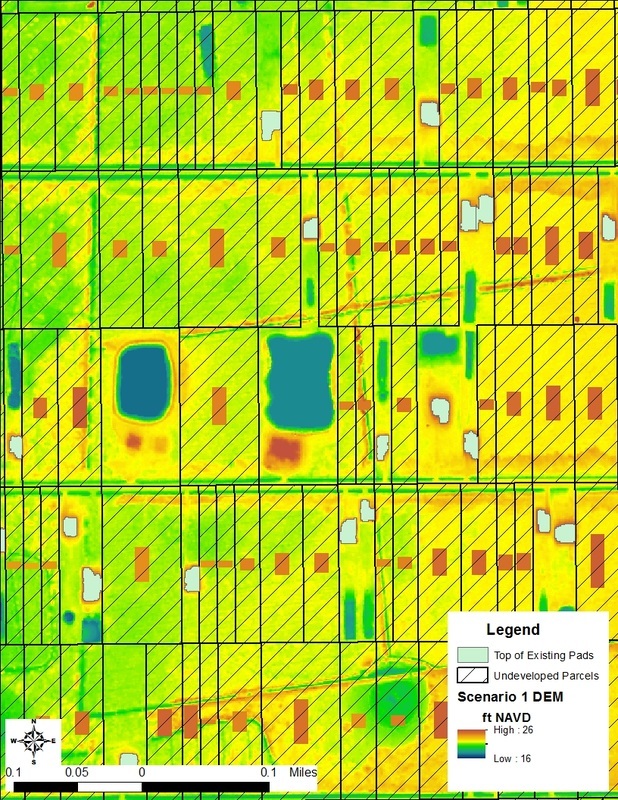 The design storm was run under different initial conditions in order to better correspond to the FEMA Baseflood Elevation Maps (BFE) available in the study area. The final design storm simulation used the results from July 29, 2004 as the initial conditions. These results were most similar to the BFE results in the study area. The average difference between the BFE and MIKE SHE/MIKE 11 predicted peak elevations is approximately four (4) inches across the entire study area and the water surfaces generally parallel each other. Based on these results, it was determined that it is appropriate to use the MIKE SHE/MIKE 11 model to estimate the relative change in peak water surface elevations under various build-out scenarios within the Golden Gate Estates. The results of the scenarios analysis where compared to the existing conditions model results to estimate the relative change in the BFE estimated from the MIKE SHE/MIKE11 modeling across the study area. 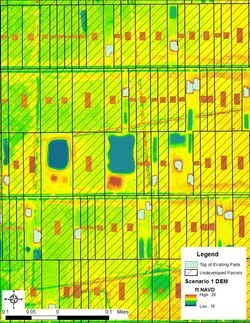 It was found that predicted change in the BFE is directly related to the volume of fill placed below the BFE under future build-out conditions.